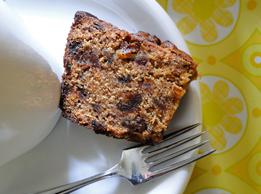 This fruity cake is so easy to make, so don’t worry if you haven’t done much baking before.It doesn’t use any added fat at all and it’s high in fruit and fibre, making it a healthier choice. 1. Put the bran flakes into a mixing bowl and add the milk, apricots and sultanas. Stir well. Cover and leave to soak in a cool place for 1 hour, stirring from time to time. 2. Preheat the oven to 180°C, fan oven 160°C, gas mark 4. Line a 900g (2lb) loaf tin with greaseproof paper. 3. Add the sugar, flour, beaten eggs and mashed banana to the soaked mixture and stir thoroughly. Spoon this mixture into the prepared tin. 4. Transfer to the middle shelf of the oven and bake for 50-55 minutes. Cool in the tin for 10 minutes, then turn out carefully and cool on a wire rack. You could ring the changes by using dried cherries or dried blueberries instead of apricots, and replacing the sultanas with raisins. freezer bags, ready to take for a packed lunch – they will have defrosted by midday.